This free Easter craft uses inexpensive materials – colored paper clips and craft fun foam. I think it would make a great project for Easter art class! 1. Print and cut out the Bunny Face Pattern. Trace onto white fun foam and cut out. 2. Use a paper punch to cut a small circle from pink fun foam and glue it in the center of the whiskers as the nose. 3. Cut the center out of the paper pattern ears, then trace on pink fun foam. Cut out these pattern pieces and glue to the bunny’s ears. 4. Using red marker, draw a smile on the face, directly under the bunny’s nose. 5. 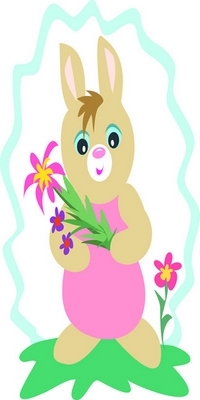 Use the paper punch to cut a hole in the bunny’s ears. Attach a colored paper clip. 6. 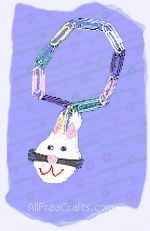 Finally, connect paper clips in a circle large enough to go over your hand, then attach both ends to the paper clip on the bunny face to finish your Easter bunny bracelet. If you prefer, the bunny can be clipped to a jacket zipper, a pocket zipper or your book bag, as a pendant rather than a bracelet.